Although smaller, Jerseys cows are incredibly efficient feed converters compared with other breeds. They have the unique biological ability to utilize the energy in feed for milk production, rather than expelling it as waste. Jerseys deliver a quality product that you get paid for. Compared to average pooled milk, a glass of Jersey milk has 18% more protein, 29% more milkfat and 20% more calcium. It is also especially rich in vitamins. Studies show that Jerseys save 13-18% in total feed expenses compared with other breeds. With feed costs representing approximately 55% of the input in your dairy operation, this can be a significant savings. With Jerseys, decreased feed requirements can result in the need for less crop land, 24% less manure storage, as well as reduced costs to harvest and store feed. Less phosphorus in the manure also benefits the environment. 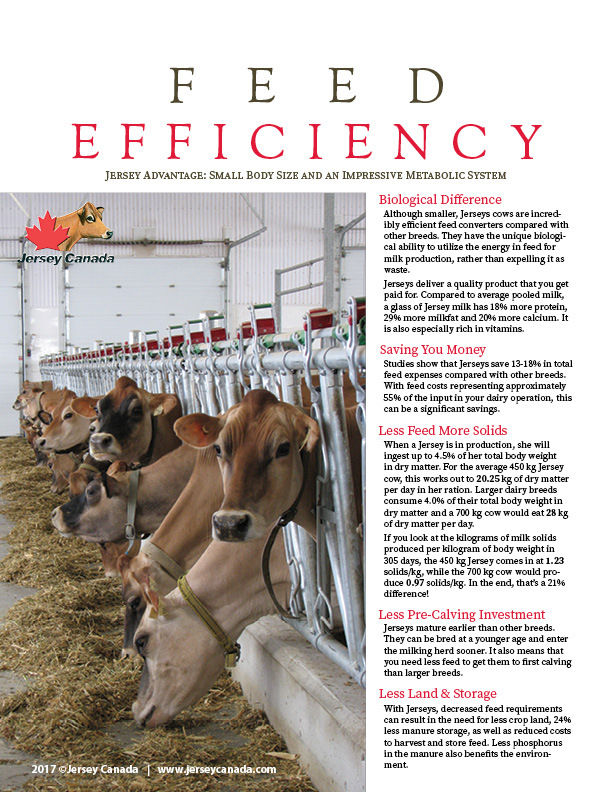 View or download our 8-page brochure that talks about the efficient and profitable Jersey cow, breed progress, and why the Jersey breed is perfect for today's dairy operation. When a Jersey is in production, she will ingest up to 4.5% of her total body weight in dry matter. For the average 450 kg Jersey cow, this works out to 20.25 kg of dry matter per day in her ration. Larger dairy breeds consume 4.0% of their total body weight in dry matter and a 700 kg cow would eat 28 kg of dry matter per day. If you look at the kilograms of milk solids produced per kilogram of body weight in 305 days, the 450 kg Jersey comes in at 1.23 solids/kg, while the 700 kg cow would produce 0.97 solids/kg. In the end, that’s a 21% difference! Energy Levels - This is not as critical of a concern in a Jersey ration, given lower maintenance requirements, but should still be balanced accordingly. Copper Levels - Keep copper at 20ppm in a Jersey ration, less than for Holsteins. Do not overfeed any one feed source - a balance of sources is preferred, as in any breed. Sharing one ration between two or more breeds is very possible. Work with your nutritionist to find the balance. It may often mean optimizing the ration for the Jerseys, and allowing for the larger breed to simply eat more, taking advantage of their size. Jerseys mature earlier than other breeds. They can be bred at a younger age and enter the milking herd sooner. It also means that you need less feed to get them to first calving than larger breeds. The first 12 hours is the most important. During this time, about 2 to 3L of colostrum must be fed in order for the calf to get all of the antibodies he/she will need to fight of disease. Colostrum is usually continued for the first 3 days. Some breeders have found that they must add water to very high solids Jersey milk to reduce sugar levels of the milk. A section on care of newborn calves follows this section. Of the utmost importance is to get colostrum into the calf as soon as possible after birth. Use of a calf blanket could be helpful in cold weather. Whole milk is fed to the calf for this period at a rate of 3 L twice a day. A third feeding could be included on days which are -25 degrees or colder if the calves are raised in hutches. The use of calf blankets could negate the need for extra milk on these cold days. Calves should be taken off whole milk as soon as they are eating 1 to 1.5 kg of calf starter per day. It is also important to have high quality hay available at this age, preferably a fine second or third cut hay. At this time, grass hay is beginning to be fed and calf starter is increased to 2 kgs per day. The large amount of hay being fed ensures that the rumen is working well and that the heifers have a deep, open rib. The grain provides the energy needed to keep them growing. At this time, the heifers should be switched to a heifer ration. They should be fed 2 kgs of the ration along with grassy hay free choice until shortly before calving. During this period, you may find some of the heifers starting to get too heavy. If so, either reduce the amount of grain they are receiving or put them with a group which is older. If you don't, the fat heifers will not grow to their potential height and will begin to make fat deposits in their udder; therefore reducing future milk production and udder texture. Maintenance is the key during this period. Hence a diet consisting of free choice hay or pasture along with enough energy in order to maintain reasonable body condition. A dry cow feeding regimen is more important with Jerseys than with other breeds to minimize the risk of metabolic disorders. A dry cow ration heavy in grass hay is preferred. No grain is fed to the dry cows until about two weeks prior to calving. The milking ration can be gradually introduced two weeks prior to calving. Be sure to maintain access to dry-cow oriented minerals and supplements. What is the difference between feeding Jersey heifers and heifers of larger breeds? Typically, Jerseys mature faster than other breeds and can be at risk of becoming overweight if overfed. This is may be an issue when they are mixed with other breeds as larger breeds need more energy in order to meet their genetic potential. Often, the high energy ration fed to both breeds can result in the Jerseys becoming overweight, where growth may slow down and fat can deposit in the udder - therefore reducing future milk production. To avoid this problem, lots of hay should be fed and Jerseys might be moved with an older group as soon as they appear too heavy. 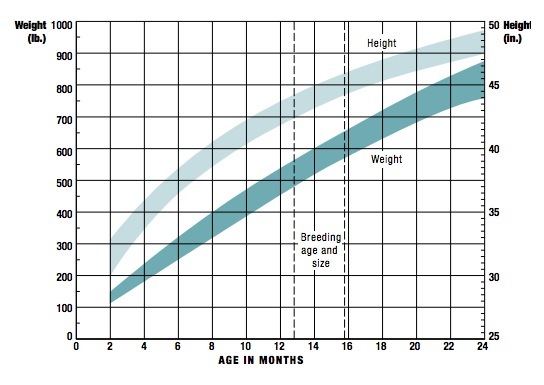 Competing with heifers three months and older will help to reduce weight and should more closely match the feed the heifer requires at that age. Ensure that your heifers have lots of space for exercise, which will also contribute to the proper body condition. A common mistake is to group heifers by size, rather than age, when Jerseys and larger breeds are in the same pen. This increases the problem for Jerseys to get too much energy. In the situation where size is comparable, the younger heifers of larger breeds could still be on calf starter while the Jersey is on a heifer ration with lots of hay. The problems described above could result in accelerated weight gain where too high of energy intake becomes a problem and needs to be monitored. Assessing the body condition of the heifers in each pen and making some changes will help. As gatekeepers of Jersey data and providers of multiple tools and programs, Jersey Canada helps breeders make good decisions. Our services can support your profit model, assess the breeding value of your Jerseys, improve your stock, build on your investment, and develop the breed as a whole. Most people can appreciate the pure beauty of a Jersey cow. Her good looks, high components, easy calving and incredible character. 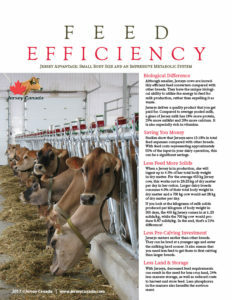 Our Feed Efficiency FACT SHEET will also help you understand how the Jerseys small body size and impressive metabolic system make her an excellent choice when adding cows to the herd. She can save you money in so many ways. Read the facts.